We are back with another issue of ‘Best of Beacons’ this Week. This week we’ve got a great lineup of beacon articles in store, right from Google’s announcement about testing a beacon-enabled mobile app called ‘Hands Free’ to Business Insider’s report on the boom in IoT. So sit back, sip a cup of coffee, and check out the stories we have lined up for you. Google recently announced that the company is looking forward to explore other alternatives of mobile payment solutions, such as ‘hands-free’ payments, by testing a beacon-enabled mobile app called ‘Hands Free’ that consumers can use to make and confirm purchases at participating retailers. Testing of the app has already begun in the southern San Francisco Bay area with merchants such as McDonald’s and Papa John’s participating. Some local eateries are also involved in the project. Google will be adopting a wait-and-see approach before the company decides to move the Hands Free app beyond the pilot stage and launch it. Check out this article to know more about Google’s Hands Free app. In the process of building aniBeacon app, a developer faces numerous challenges or issues like the inability of the app in detecting when it exits a beacon region, the app exits a region while the user is still inside the region, the app doesn’t wake up to beacons, and so on. To help developers overcome such challenges and learn how to build a beacon app from scratch, we have announced a new ebook: A Developer’s Guide to Building an iBeacon App. This ebook covers everything from basic beacon terminologies, common myths about beacons and the reality, things to do before building an app, challenges faced while building an iBeacon app, mistakes to avoid, and best practices to follow during beacon app development. Download the ebook to find everything you need to know for building an iBeacon app. According to a report by the Centre for Economics and Business Research (Cebr), Big data and Internet of Things (IoT) are expected to add £322 billion to the UK economy from 2015 to 2020. The amount equates to an average of £54 billion per year, or 2.7% of the annual GDP over the next five years. Specifically, big data analytics is estimated to contribute an average of £40 billion per year to the UK economy by 2020. Adoption rates for big data analytics and IoT are estimated to rise from 56% in 2015 to 67% by 2020 and from 30% in 2015 to 43% by 2020 respectively. The primary reason for traction towards big data is insight into consumer behaviour with over 42% of the organisations admitting to have used big data for this purpose. In contrast, only 39% organisations tend to use IoT to reduce costs and gain insight into operational data. Now organisations are looking forward to use combined benefits of both big data and IoT. 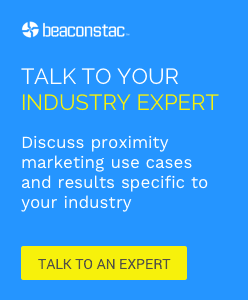 With close to 4 million beacons deployed globally, last year was arguably the best year for proximity marketing yet. To add more excitement to the scenario, the latest numbers from Proxbook’s Q4 2015 Report indicate that the industry is well on track to deploy 400 million beacons by the year 2020. Most of the beacon use cases among the beacon deployments were from retail. At the same time, we have also seen some unique use-cases coming up in non-retail verticals such as sports industry and airlines. Among all the use-cases, one of the most prevalent purposes of using iBeacon technology has been data collection. For instance, retail stores are syncing mobile apps with beacons to understand customer behaviour and collect powerful customer intelligence. Check out this article to learn some more ways businesses can use iBeacon technology. Internet of Things (IoT) is fast driving innovation and new opportunities by bringing every object, consumer and activity into the digital realm. And going ahead, the proliferation of connected devices coupled with improved, less-expensive technology platforms will only disrupt the rapid growth of IoT-enabled capabilities across industries. BI Intelligence recently released the ‘The Internet of Things Ecosystem Research’ report which projects that the number of devices connected to the internet will increase from 10 billion in 2015 to 34 billion in 2020. The report states that nearly $6 trillion will be spent on IoT solutions over the next five years. Read the contents of the report to find more on how the boom in IoT will change the landscape by 2020.